This tutorial is designed for beginners who are new to R language. It will help them understand the basics / fundamentals of R language. 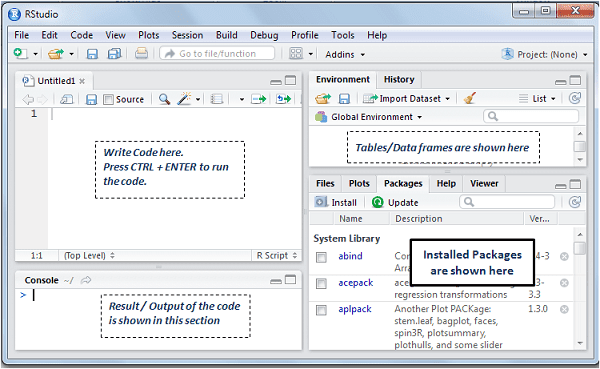 It explains how to download and install R/RStudio and also covers simple programs for practice. R is one of the most popular programming language for data analysis and statistical modeling. Its popularity has increased many folds in recent years. It has become first choice to predictive modelers for building models as R supports thousands of packages. How to download and install R? To download R, visit official site of R - http://www.r-project.org/. 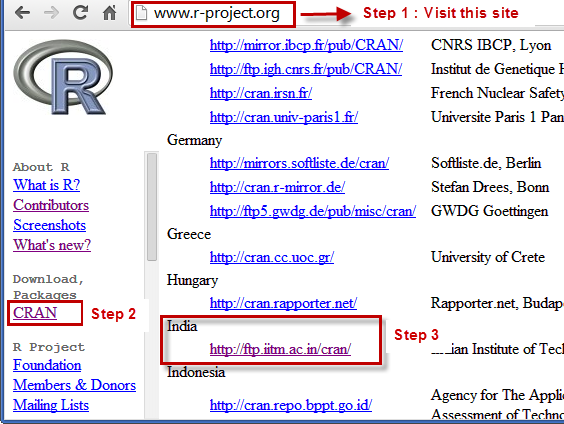 Click on the link "CRAN" located at the left hand side of the page. Choose your country and click on the link available for your location. 1. To open R Editor, Go to File >> New Script (Shortcut : CTRL + N). It is where you write code or program. Press F5 to submit your code. 2. R Console - It is where you can see result/output of your code. Please note that you can write code here as well but it's difficult to edit or make changes in the R Console. 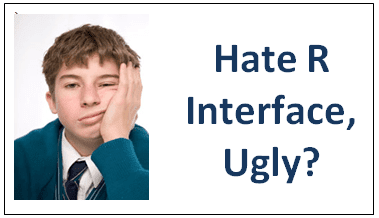 Many novice R users hate R interface. It looks boring as compared to SAS/SPSS. It is not user friendly at all. It makes writing program complex. How to make it less boring (or interesting)? RStudio comes to rescue! What is RStudio and its benefits over standard R? RStudio was built to make your life easy as a R programmer. It is available in open source for FREE. Unlike standard R, it supports various premium features such as intelligent code completion, syntax highlighting, structured R documentation, interactive debugging tool etc. In layman's term, RStudio is just an interface enhancement to standard R. Programming is similar in both the platforms. The  tells you the resulting value is the first result. 2. The # character at the beginning of a line signifies a comment. 3. The operator "<–" (without quotes) is equivalent to "=" sign . You can use either of the operators. 5. R uses forward slashes instead of backward slashes in filenames (as shown in the image above). 6. The setwd() function tells R where you would like your files to save (changes the working directory). Notice the forward slash is used in the filename above. 7. The c function is widely used to combine values to form a vector. 8. 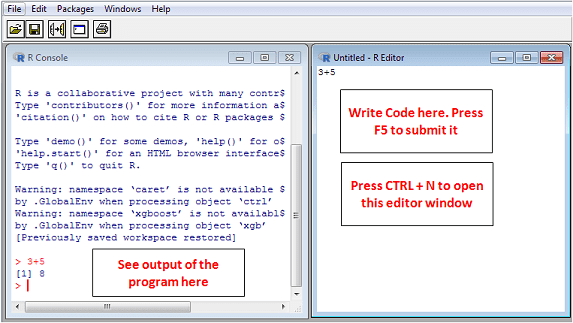 In RStudio, press CTRL + SHIFT + A to format your code. 9. R uses NA to represent Not Available, or missing values. 10. To calculate sum excluding NA, use na.rm = TRUE (By default, it is FALSE). 11. The form 1:10 generates the integers from 1 to 10. 12. R is case-sensitive, so you have to use the exact case that the program requires. 15. Object names in R should begin with a letter. 16. Unlike SAS and SPSS, R has several different data structures including vectors, factors, data frames, matrices, arrays, and lists. The data frame is most like a dataset in SAS. You can use fix() function and give the name of an existing function, R shows you the code for that function in a NotePad window and you can type whatever you like. In this example, we are asking R to open mydata data frame. When you leave NotePad, say "Yes" to the question "Do you want to save changes?" (unless you want to discard your changes). Don't "Save As...", just "Save"; R will update your function automatically. Similarly, you can see the source code of any R function by using the following code. It opens the source code of a function. Alternatively, you can use the debug() function to view the backend code. In R Console, you can retrieve it with the UP arrow key and edit it to run again. You can also write existing data frame in CSV format by using write.csv() function. In this example, we are saving file in CSV format by name file1. You can also give full path where you want file to be saved. By default, it saves the file in the current working directory. You can save a particular dataframe in R format. You can use the command below to get rdata format file in R.
18 Responses to "Getting Started with R"
Excellent platform to learn R from basic. Thanks for providing valuable information.please provide more information Deepanshu. Excellent resource for a beginner like me! Thank you!! ONe of the best places to learn R .. Thank you soo much for coming up with this most useful site admin.. Thanks for the basics R Language ! !